Many customers also like to add fascias, barge boards, ridge cappings and other types of flashings to their construction to help seal the sheeting in and also to provide a neater looking finish to the end product. This could include covering up cut, raw edges or to join one set of sheets to another. A few of the common flashing types are set out below, although many other flashing designs can be manufactured. Flashings are generally manufactured in any length you require up to 3m (longer lengths are available upon special request however timescales and costs may vary). Again, the dimensions of the flashings are fabricated to order – for example, a right-angled corner flashing such as 200mm x 200mm or 150mm x 150mm or even a variation such as 165mm x 213mm. Before flashings were made available, carpenters had to come up with all sorts of creative ways of preventing water from penetrating through the roof. For example, they would angle roof shingles away from the joints, add in some steps near the chimney to divert the water or put chimneys at the ridge of the roof. However, when flashings were manufactured, water penetration at places such as vent pipe and chimneys, as well as door and window openings, was decreased – which immediately made buildings more robust and durable, while reducing the chances of mould indoors. The majority of our flashings are made from plastic coated steel known in the industry as “Plastisol”. 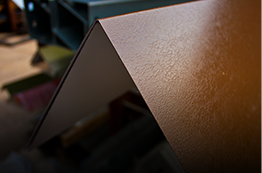 We are also able to fabricate flashings from galvanised steel, polyester coated steel and sometimes aluminium. It may be possible to fabricate from other materials if you have a special product required.